Monty and I went for a walk this afternoon in the valley. He galloped and positively charged across the back field until he reached the wooded entrance to the valley. I saw a Jack-In-The-Pulpit. This is an interesting looking denizen of the Southern Ontario region. The flaplike spathe (the hooded floral leaf) is light green when young, later changing to a purplish brown. You can see a young and more mature leaf in the images above and below - by virtue of the purplish brown striping. It is often striped and curves over the club shaped spadix which you can see in the image above poking up (the Jack in his pulpit). They are mostly found in low open woods or swampy areas in early May. I don't know what this is, but it looks interesting - symmetrical, with spikes on the leaf. I just like the look of the broad, bright green single leafed plant above. The valley, and surrounding areas (including where we live) used to be an apple orchard. The apple trees have gone wild, but still produce some nice fruit later in the summer. The blossoms are just now opening up. Pine needles. Fresh and full of Vitamin C.
Spruce needles - also young and full of Vitamin C. When making a bed for the night in the woods, it is better to use soft Spruce boughs that lay down flat, than Pine needles that poke and spike you at all hours. Violets give a purple and blue and white splash to the green woods floors. Coltsfoot is one of the earliest appearing spring flowers in Ontario. Garlic Mustard - Alliaria officinalis. This highly competitive plant spreads rapidly and effectively blocks sunlight and uses nutrients from which other wildflowers such as Trilliums would normally derive nutritive value. I'm not sure if this is Wild Carrot (Queen's Anne Lace), Poison Hemlock, Fool's Parsley or something else. Given that 2 of the 3 plants I've just listed are poisonous, I'll go for a positive identification before nibbling on it. This neat looking polypore bracket fungus looks new - the flesh is white and spongy, yet firm. The top looks like feathers. 1. They nearly all grow on wood, such as trees, logs, stumps, or buried wood. That's because these fungi are either decomposers or parasites, or both. This does not mean all mushrooms that grow on wood are safe to eat. 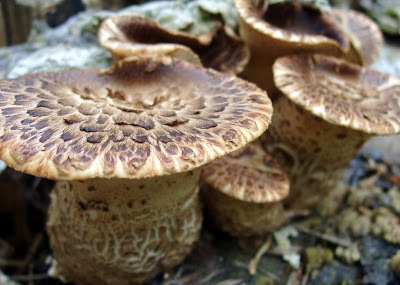 Other types of mushrooms also grow on wood, and some of them are poisonous. 2. Polypores, sometimes also called bracket fungi, are generally shaped like shelves, not like umbrellas (although some are crust-like). If there's a stem, it's usually short and off-center. Again, not all mushrooms with off-center stems are safe to eat. Mushrooms other than polypores have off-center stems. 3. Polypores all have many tiny holes, or pores, on the undersides of their caps (polypore means many pores). Microscopic spores emerge from these pores. You can usually see the pores (but not the spores) with the naked eye, but sometimes they're so small, you'll need a magnifying glass or loupe to see them. Turkey Tail: Trametes versicolor. This saprobic fungus feasts on the dead wood of hardwoods (and rarely on those of conifers). After a good rollicking snuffle through the woods, I put Monty's leash on and we headed out. Monty sniffed a quick hello to a passerby. Tired, but happy, he slept for the rest of the afternoon.